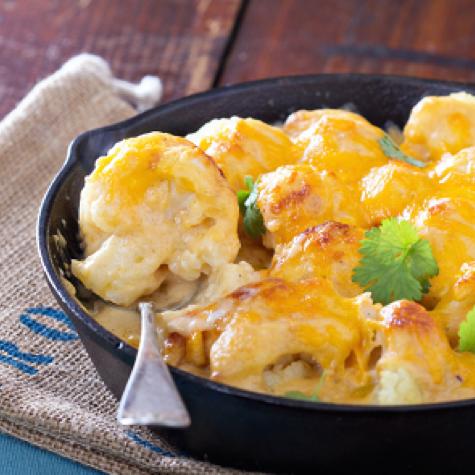 Colman’s have teamed up with popular food blogger and YouTube chef Ian Haste to give you this delicious Cauliflower Cheese with a Crunchy Kick recipe, perfect for an extra special Roast Dinner this Summer. Section the florets from the cauliflower and par boil for around 6 minutes in boiling water. Meanwhile add the Colman’s Cheddar Cheese Sauce mix to a pan with milk and heat, add salt and pepper if desired and half of each of the cheeses. Heat gently to melt the cheese and stir in the Colman’s English Mustard. Drain the vegetables and add to a dish, pour over the cheese sauce, making sure it goes amongst all the veg, scatter over the other half of the grated cheeses. Bake in a preheated oven for 20-25 minutes at 200°C,190°C fan, Gas mark 6 or until brown and crispy on top.